The writer Dan Hind recently commented in his pamphlet, Common Sense, that many people with mental health problems who have taken part in occupation movements around the world in recent years have noticed an improvement in their condition. I myself joined the editorial team of The Occupied Times of London just as I was beginning to emerge from a long period of anxiety and depression which had suddenly halted every aspect of my life. The occupation camps were by no means a utopia, and Occupy doesn’t have all the answers to the problems of humanity, but I have no doubt that the acceptance of difference and the willingness to listen and be listened to – which are hallmarks of the global Occupy movement – mean that I haven’t been the only person with experience of mental illness (or, indeed, substance addiction or homelessness) who has felt the ameliorating effects of collective endeavour and political empowerment. If there’s one conclusion I’ve come to after five years of suffering from it, it is that mental illness doesn’t happen in isolation. We know that one-in-four Britons will suffer from a mental disorder at some time or other. The World Health Organization even predicts that depression will be the second most widespread illness in the developed world by 2020. But mental illness is not just a matter of statistics or distant ‘others’, far removed from regular human activity. It is all too human. It is dependent on how we order our own individual worlds and how we relate to other human beings. We evolved as a social species and it was largely thanks to our ability to co-operate, to share tasks in small, mobile, co-dependent groups, that we outlasted other early humans. In recent decades, political, economic and cultural shifts have made society far less community-minded and far more greedy, selfish and acquisitive. But this goes against our collective past. We are not built to go it alone. Mental illness must not be just a burden for the individual sufferer or their family because it is reflective of our society. The social breakdown, inequalities of health and wealth, celebrity, consumerism and binge culture that we see all around us affects our mental health. These damaging phenomena are a monument to the unfettered market that has ruled our lives. The economic model that the establishment is desperately trying to prop up is premised on exploiting our worst instincts. The policy of ‘Care in the Community,’ pursued for the last thirty years, does represent a more humane approach compared to the large Victorian asylums. Those imposing buildings were conceived of more as quarantines where the uncomfortable truth of ‘madness’, ever-present throughout human history, was sealed-off in an act of segregation. However, despite the recent move towards inclusiveness and a softening of the political language, the reality is still too often one of isolation, stigma and neglect, if not outright abuse. By accepting that sufferers of mental illness are a part of and not apart from society, we must now accept that aspects of our society are contributing to the dire problems with mental health. It is also crucial that there is widespread acceptance that mental illness is something that can befall anyone, including CEOs of investment banks. The pervasive neoliberal mantra of ‘private good, public bad’ has ring-fenced large swathes of the economy as beyond regulation, but if the supreme aim of every country is to create an amenable business environment then the well-being of its citizens can never be anything more than an afterthought. Instead we’re left with reactive government measures in health, crime, education and environmental policy. These become largely thankless struggles to clean up the mess wrought by an economic system that fosters inequality, promotes narcissism and propagates the notion that all human meaning resides in the relentless pursuit of material wealth. Too much of healthcare becomes ‘fire-fighting’, when much more of it should be about prevention and care. I prefer the argument for helping people to lead healthy and meaningful lives, but even those with a solely economic view of humanity must deduce that it costs much more to deal with the effects of the problems than it would to begin to tackle them at root. 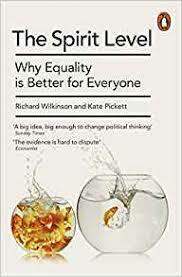 Research by Kate Pickett and Richard Wilkinson for their book, The Spirit Level, reveals that more unequal societies do worse on a number of social indicators – including having much higher rates of mental illness. They write that mental illness is closely related to status anxiety, and so more unequal and callous countries, like ours, leave more people marginalised, more ‘losers’, and more problems for everyone. Such high levels of mental illness mean this issue can no longer be brushed under the carpet. Is there any other issue which touches nearly everyone’s lives yet is so ignored or misunderstood by politics and the media? The rates of mental illness demand that we re-examine our attitudes and language concerning the concept of ‘madness’. Indeed, Mark Fisher, the author of Capitalist Realism, has called for the politicisation of the issue of mental illness to be one of the main rallying points of any new left movement. Occupy is teaching us all how interconnected our lives and our struggles are, and we’re learning that the only way to fight the atomising force of neo-liberalism is through solidarity, collective action, mass civil disobedience and the reclamation of public space. Dan Hind, Common Sense: Occupation, Assembly and the Future of Liberty. Kindle Edition: Myriad Editions/New Left Project, 2012. Tim Jackson, Prosperity Without Growth? Economics for a finite planet. 2009. Richard Wilkinson & Kate Pickett, The Spirit Level. Penguin, 2009. Mark Fisher, Capitalist Realism: Is there no alternative? Zero Books, 2009. Michael Richmond had his first novel, Sisyphusa, published last year. This is a dystopian allegory for his own experiences of mental illness, but also a polemic of contemporary politics, economics and society. It was praised by respected authors, and recently recommended by Deborah Orr in The Guardian. Michael is also a member of the editorial team of The Occupied Times of London, the highly regarded newspaper that came out of the Occupy London movement. This is a sample article from Asylum 19.3. To access the latest issue in full, SUBSCRIBE HERE.